The recent announcement of the official ratification of four super-heavy elements, with atomic numbers 113, 115, 117, and 118, has taken the world of science news by storm. It seems like there is an insatiable appetite for new information about the elements and the periodic table within the scientific world and among the general public. Maybe it’s all about nostalgia and the fact that the periodic table is like an old friend to anybody who has ever taken any chemistry class whatsoever? Or maybe it has to do with the meme-like status that the elements, their symbols, and their table have achieved in recent years. The elements are everywhere. One of the most repeated statements about the latest four elements, none of which have names yet, is that their discovery has brought about the completion of the seventh period of the periodic table. But this is not necessarily the case. In recent years a perfectly respectable and alternative periodic table that was first proposed in the 1930s has been making a comeback. This is the left-step periodic table proposed by the French polymath Charles Janet, which is being actively supported by many periodic table experts. This table is obtained by making two small changes to the conventional table. First the element helium is moved to the top of the alkaline-earth elements, on the basis of its two electrons, just as the alkaline earth elements have two outer-shell electrons. Secondly, the entire two-column s-block is chapped off the left side of the table and transported to the right edge. This very elegantly shaped left-step table shows greater regularity than the conventional table by featuring the repetition of every single period length including the first very short period of two elements. Left step periodic table. Courtesy of Eric Scerri. But to return to the new elements, the left-step table shows that the seventh period is not in fact complete even after the inclusion of elements 113, 115, 117, and 118. Only when elements 119 and 120 are created will it be true that this period is really complete. Of course most of the news articles have acknowledged that the ‘completion’ of the seventh period does not preclude the discovery of elements even heavier than element 118. The question is where does it all end? The predictions depend on just how one conducts the calculation. According to a simple argument that relies on Einstein’s theory of relativity the highest atomic number that can possibly be produced is 137. Alternatively, if one takes into account the finite size of the nucleus of the atom, the answer is either 172 or 173. But there are many other interesting questions connected with the periodic table that were not even mentioned in the recent flurry of news articles. For example, in addition to asking about elements beyond number 118, one might ask about the possibility of elements lying somehow within the current range of elements? This question is not as far-fetched as it might seem. There are many serious academic studies that have considered the possibility of quarkonium matter. Since a proton consists of three quarks it is not inconceivable that elements with atomic numbers increasing in units of one third, rather than by integral values, might actually exist. But leaving aside such exotic species there is a great deal of debate concerning some very stable light elements such as hydrogen and helium. It has long been recognized that the element hydrogen could be placed at the head of the halogen group containing fluorine, chlorine, bromine, iodine and astatine. There is no clear-cut criterion that demands that it should be kept in group 1 of the periodic table. The case of helium has already been alluded to. In the left-step table this element is no longer regarded as a noble gas but should be placed into group 2. Finally there is an ongoing debate concerning the membership of group 3 of the periodic table. Some periodic tables show the group as containing scandium, yttrium, lanthanum, and actinium while many others feature scandium, yttrium, lutetium, and lawrencium. Which version is more correct or indeed does it make sense to seek one objective correct version of the periodic table? At the same time that the International Union of Pure and Applied Chemistry (IUPAC) announced the ratification of the four new elements, they also approved the formation of a task force, led by yours truly, to discuss and make recommendations on the constitution of group 3 of the periodic table. Clearly the elements and the periodic table will continue to be in the news for some time to come. Featured image: Elements Background. (c) Eyematrix via iStock. Eric Scerri is a chemist, writer, and philosopher of science. He is a lecturer at the University of California, Los Angeles. 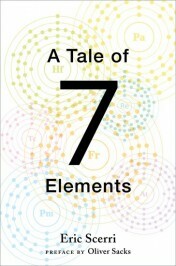 He is the author of A Tale of Seven Elements, The Periodic Table: A Very Short Introduction, and The Periodic Table: Its Story and Its Significance, and co-editor of the forthcoming Essays in the Philosophy of Chemistry. Charles Janet, who was an engineer and demonstrated some capability in research in macroscopic biology, proposed that periodic chart at age 77, at which senility might have begun. No real chemist would accept He as a member of a column of which other elements are metals from Be to Ra. Accordingly, no real chemist should take seriously any deduction or implication based on that chart. The relative position of H is ambiguous: some periodic charts place H above both Li and F, for which chemical justification exists in either case. “insatiable appetite for new information about the elements and the periodic table within the scientific world and among the general public”? Dr. Scerri inhabits perhaps an alternative universe from the one in which most of us reside. Another concise and well thought out presentation of a contentious issue. The left-step arrangement needs to be faced head on, even by the nay-sayers. I’m pretty sure you can handle any criticism that arises out of this with your usual aplomb. The “finishing of the table” so erroneously reported in general media is balanced here in a subtle yet direct manner. Keep up the good work. Luckily Nature doesn’t give a hoot about received wisdom from childhood which makes you one emotionally secure. The fact is that consistent duality (that is, paired periods each of which contain a half/double square’s worth of elements, so that a dual contains a square (of even integers) number of elements (4,16,36,64…) allows one, if one represents each element as as a single sphere, to stack the elements in such a way as to create a tetrahedral arrangement- indeed, every other alkaline earth atomic number (always from the second Janet period of a dual) is a tetrahedral number, right out of the Pascal Triangle- that is: 4,20,56, and hypothetically 120 (if ever synthesized). Intermediate alkaline earth atomic numbers, including that of He, if you start with 0, are all arithmetic means of the flanking tetrahedrals. Though based on atomic numbers rather than atomic weights, this reproduces the so-called ‘triads’ which were part of the basis of the discovery of periodicity in the first place. And if anyone isn’t convinced, Pascal Triangle mathematical motivation is much more strongly evident in the shell structure of atomic nuclei, starting with harmonic oscillator magic numbers, which are exactly double tetrahedral numbers 2,8,20,40,70,112,168…. Eric Scerri, Presenting the left-step periodic table, Education in Chemistry, 42, 135-136, 2005. Philip Stewart, Charles Janet: unrecognized genius of the periodic system, Foundations of Chemistry, April 2010, Volume 12, Issue 1, pp 5-15. L.M. Simmons, (Letter to the Editor). Bent, H. A. New Ideas in Chemistry from Fresh Energy for the Periodic Law; AuthorHouse: Bloomington, IN, 2006. Janet, C. Chem News 1929, 138, 372. R. Hakala, The Periodic Law in Mathematical Form, Journal of Physical Chemistry, 56, 178-181. E. Scerri, A Very Short Introduction to the Periodic Table, Oxford University Press, Oxford, 2011, chapter 10.
beeing a chemist, I severely disagree with the way you hide a conflict. Once again, you try to circumvent the arguments of Henry Bent (who unfortunately passed away in January 2015). One of the truly chemical arguments in favour of placing He over Be in the s-block is Electronegativity and it is H over Li and He over Be which is less contradictory than the mere convention of IUPAC – as Henry Bent worked it out, as a piece of inductive argumentation. Another chemical argument is the one Mendeleev originally worked out himself. The periodic system of the elements is a system of elements as basic substances, i.e. of ATOMS (may they be regarded chemically or physically, it does not matter) instead of simple substances, cf. NOBLE GASES or allotropes of condensed matter. So then, what is it good for, to step way behind Mendeleev´s insights and publicly speaking of Hydrogen or Helium as of “simple substances”?! He over Be is, chemically spoken, consistent with Mendeleev´s guiding principle of “first element distinctiveness”, as is N over P etc. In this way, the more important question of what makes sorts of chemical elements different or distinct, will not come up easily. It is this question of what could possibly be quantum similiarity or of what could possibly be given as a quantum similarity index, where the discovery of new elemtents shines light upon. Whether Z, as the number of protons in the atomic core, will still work as the characterizing ordinal number in Janet´s 8th or higher periods, is an open item. Quantum chemical calculations on a contemporary theoretical level indicate different electronic behaviour of the valence electrons, compared to the lighter congeners of the respective chemical group. But it is still the topology of the left step periodic table, with He over Be, which could guide the search, once again for properties of elements as ATOMS instead of properties of their condensed matter. This ist the eye-opener, which you dont´t even speak upon. For me, it is the notion of Charles Janet´s periodic system, as a very fundamental topology, which reminds me that the periodic system is not a kind of a job or letter type case for different sorts of atoms – it is the regular distance between the compartments, which gives the wrong deductions and once again, the discovery of new elements painstakingly points toward our missing understanding.